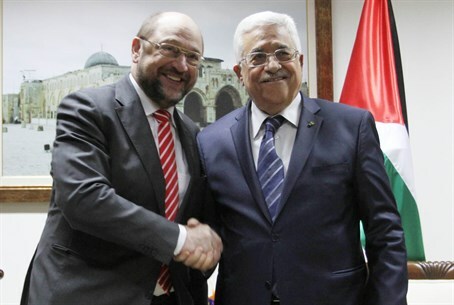 European proposal would have PA take control of Gaza, pushes Israel back to talks with pre-defined borders. A new UN Security Council resolution proposed by Germany, Britain and France calling for an end to violence in Gaza contains some significant caveats that are reportedly garnering opposition from Israel. A senior European diplomat told Walla! on Thursday that the resolution proposal includes the removal of the blockade on Gaza, transferring control of the Hamas stronghold to the Palestinian Authority (PA), and a return to peace talks based on the 1949 Armistice lines. The specific imposition of pre-defined conditions in peace talks through a UN resolution, namely that they would be on the basis of the 1949 lines, is something that the US has been opposing for years. On the other hand, the US proposed the 1949 lines as a basis in framework proposals submitted earlier in the year, before the nine-month long negotiations with the PA failed in April as the PA signed a unity treaty with Hamas. Many have noted that the recent escalation in Hamas's terror war against Israel from Gaza is a prologue to what can be expected from Judea and Samaria if Israel would vacate the region. Adding irrefutable support to this appraisal is the fact that Hamas recently attempted a coup against the PA in Judea and Samaria, which the IDF and Israel Security Agency (ISA) foiled. It is also worth pointing out that a senior PA official last Wednesday said his organization has made a "political decision" to support "slaughtering settlers," the latest in a string of calls for "open war" and a return to terrorism against the Jewish state. Europe can't "separate Gaza and peace talks"
According to the European diplomat who spoke on Thursday, the European proposal would have both sides stop attacking and define detailed security arrangements for removing the blockade while preventing an influx of weapons to Hamas. "As far as Europe is concerned, it's impossible to separate the issue of Gaza from the general Palestinian issue. Only a sustainable diplomatic solution will bring a long quiet for the two peoples," said the European source. He added that France put pressure on the US through diplomatic channels to publish US Secretary of State John Kerry's framework plan after the Israel-PA negotiations collapsed, so as to turn it into a program for the international community to pursue. For it's part, Israel reportedly is distancing itself from the European proposal, primarily due to the call for 1949 Armistice lines as a basis for talks. An Israeli diplomatic source said Thursday that Israel has not ruled out renewed truce talks in Cairo, but expects Hamas to completely end its rocket barrage first. Hamas has broken numerous ceasefires through the course of Operation Protective Edge, most recently this Tuesday.